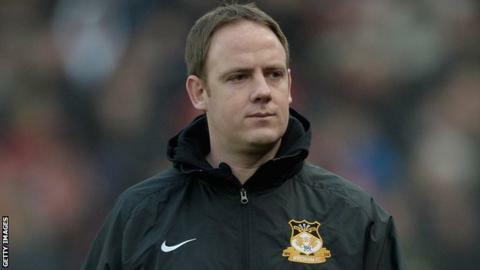 Carl Darlington says uncertainty over the managerial vacancy has been a "mental" burden for Wrexham's players. Wrexham are looking for a new manager following Kevin Wilkin's sacking and have had held talks with Gateshead boss Gary Mills. "We don't know who's coming in and when the manager's going to come," caretaker boss Darlington said. "Players are out of contract after [the Telford game]. "A lot of them have got families, children and bills to pay and with the uncertainty they're going through a big mental state at this moment in time. "The majority of the players if you asked them, I think they all want to stay at the club. Wrexham have held talks with Gary Mills after having an official approach accepted by Gateshead. "They've got to prove what they're worth and prove they want to stay here. "They know they should have done more this year and they know they should have got promotion." The north Wales club held talks with Mills after having an official approach accepted by fellow Conference side Gateshead. Mills has confirmed he has been approached by a Football League club. Darlington took temporary charge following Wilkin's departure and since then Wrexham have lost only once in seven Conference games. He left his role as head coach with Welsh Premier League champions The New Saints in December 2014 and has a contract with Wrexham until the end of next season. "I think we've done a good job in the last seven games of the season and we've steadied the ship," said Darlington, who has been assisted by Michael Oakes and Lee Jones. "From my point of view I'd love to stay here at the football club working with the new manager."